7 October. In the first of several such incidents over the coming month, an attempt by U.S. naval forces to land Chinese government troops at Chefoo is blocked by Communist opposition. 17 October. Chinese government forces land at Kirun (now Keelung) in northern Taiwan and begin marching towards Taihoku (Taipei) to accept the Japanese surrender. Before its conquest by Ching forces in the 17th century, Taiwan was never part of China. It was also ceded to Japan in 1895 before the fall of this ‘foreign’ dynasty. Nonetheless, both KMT and CCP leaders regard it as an integral part of Chinese territory. 20 October. After a month of meetings across the length and breadth of the Mongolian People’s Republic, a national referendum on independence is held monitored by Chinese officials. According to official results, all voters opt for independence. The result is accepted by the Chinese government, which recognizes the MPR’s independence in January 1946. 30 October. After being blocked from entering Manchurian ports, finally Chinese government troops are landed by the U.S. fleet at Chinwangtao from where they subsequently fight their way north. Next day, Lin Piao is ordered to reorganize all Communist forces in Manchuria into a Northeastern People’s Autonomous Army. Both sides strive to strengthen their position in Manchuria in the lull before the resumption of all-out civil war. 31 October. Even as a serious conflict looms in Manchuria, KMT and CCP negotiators continue to seek a political settlement. Hopes are raised when the Nationalist government responds to CCP proposals by agreeing to a ceasefire, discussion of a reorganization of military forces, and convening a political consultative conference as planned. 4 November. Top leaders from eastern Inner Mongolia and Hulunbuir region visit Ulaanbaatar and reiterate their wish to join the Mongolian People’s Republic. They submit a petition signed by tens of thousands of Inner Mongols who want their land to be unified with the MPR. Three days later, these leaders meet Choibalsan in person and ask for assistance in building up the eastern Mongolian government. 1 October. The Soviet ambassador to China reports that the Soviet withdrawal from Manchuria will start immediately and be completed by the end of November. China’s Foreign Ministry replies that a Nationalist army ferried by a U.S. fleet will land at Dairen around 10 October. 1 October. The Hulunbuir region declares itself an autonomous province. Five days later its leader writes to Choibalsan expressing their desire for union with the MPR. 18 October. 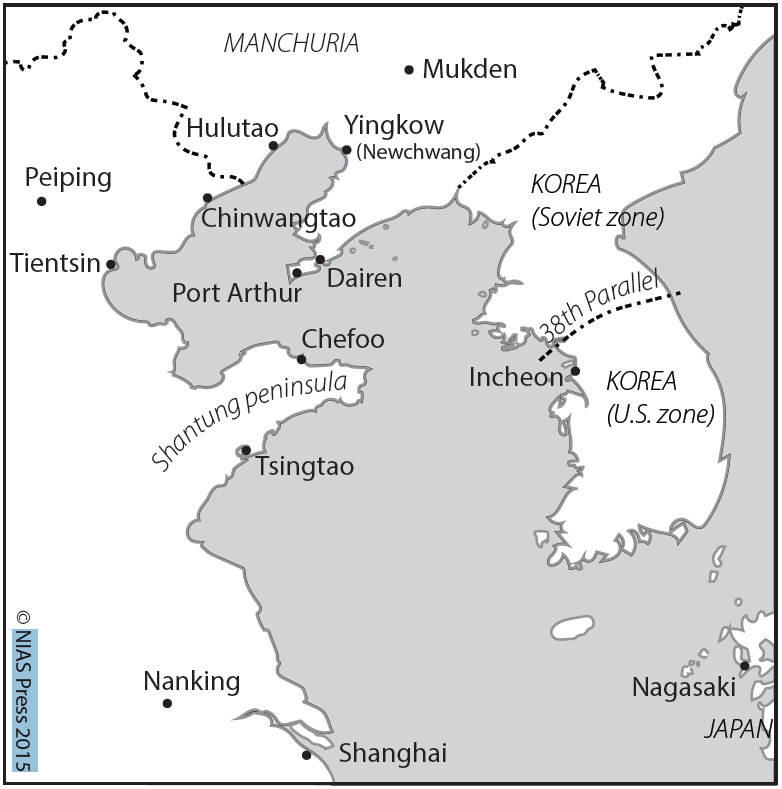 Soviet authorities refuse to allow U.S. ships to land Chinese government troops at Dairen. The U.S. fleet then redirects to Hulutao and Yingkow where occupying CCP forces with Soviet collusion again block any landing.